Sometimes watching the news or reality TV, you get a sense of hopelessness for the future of this country. From all the profanity, to celebrated reckless behavior, to shows glamorizing disrespectful people, the youth of America seem to be heading down a very destructive path. But once you turn the TV off and take a look around, it may not be as bad as you think. We have the pleasure of hosting youth groups full of volunteers throughout the year. These kids dedicate time out of their schedules to help others, not because they have to, rather, because they want to. These kids often times do jobs and tasks that are way outside of their comfort zones and far from anything glamorous. But they do these jobs with a smile and a positive attitude that reminds you that with each new generation God has provided new leaders, compassionate young people, who are going to help change the world for Him. During the month of February, we were able to host two different youth groups. One served at the beginning of the month and the other at the end. Both were a breath of fresh air. 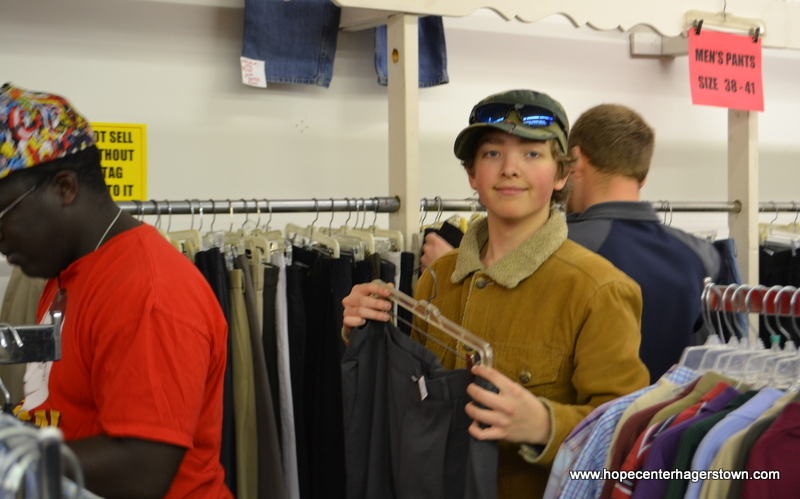 Dublin Mills Community Church brought a group of 4 young people to spend a Saturday serving around The Hope Center. 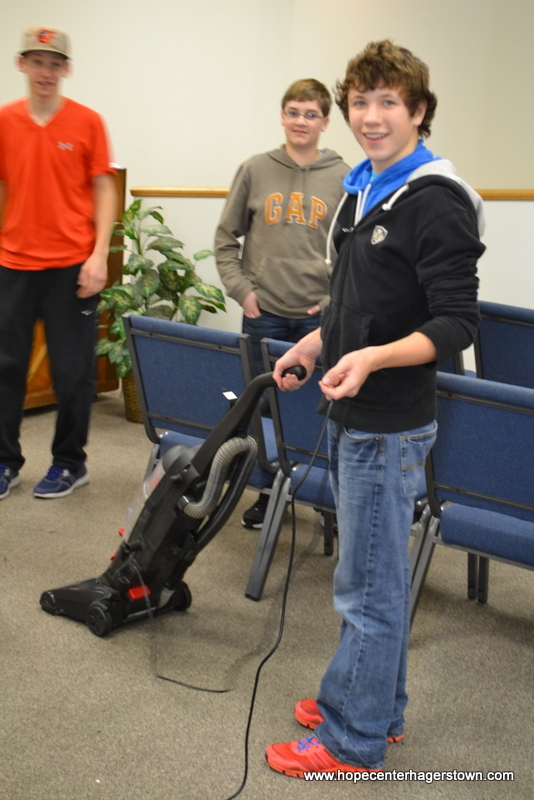 Accompanied by the church’s pastor, Sam Stoey and his wife, the young people worked from 9am until 2pm. 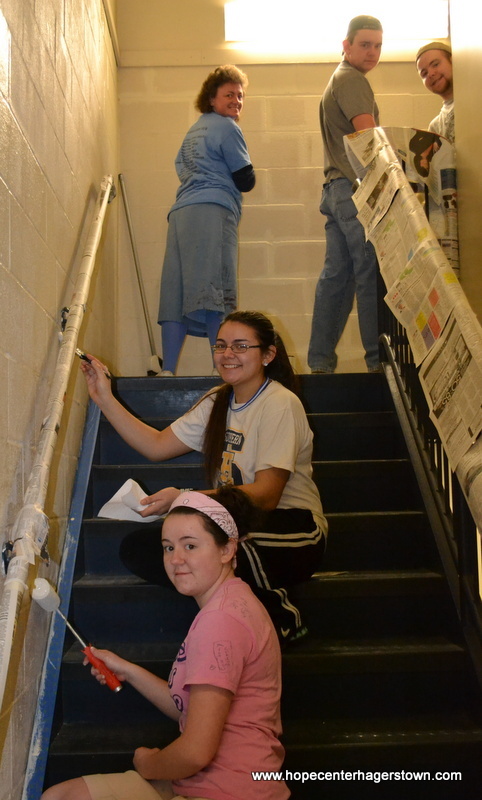 During the morning, they helped paint the stairway to our dorm facilities in our main building. After painting, the youth group helped Mrs. Stoey prepare and serve lunch for our community guests at our daily soup line while Pastor Stoey shared a short devotional with our guests. 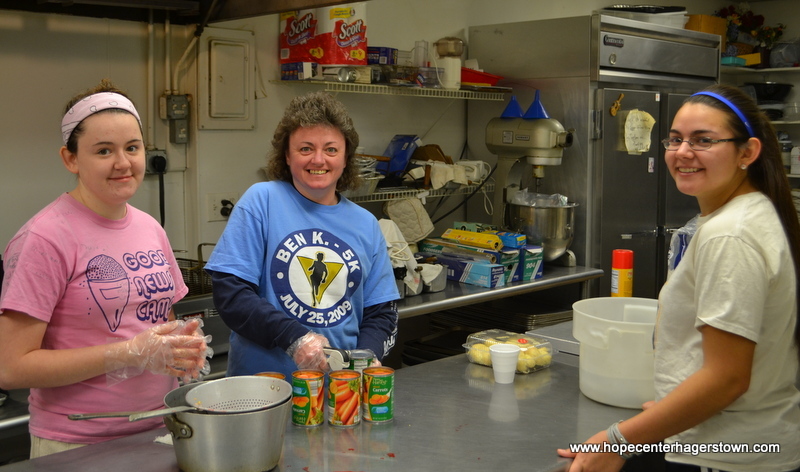 Dublin Mills Community Church has been a longtime supporter of The Hope Center in many ways. We are so thankful for their continued support, not just through prayer and financial support, but also by volunteering and helping physically. Later in February, some teens from Antrim Brethren in Christ Church came to serve as a part of their 30 Hour Famine project. 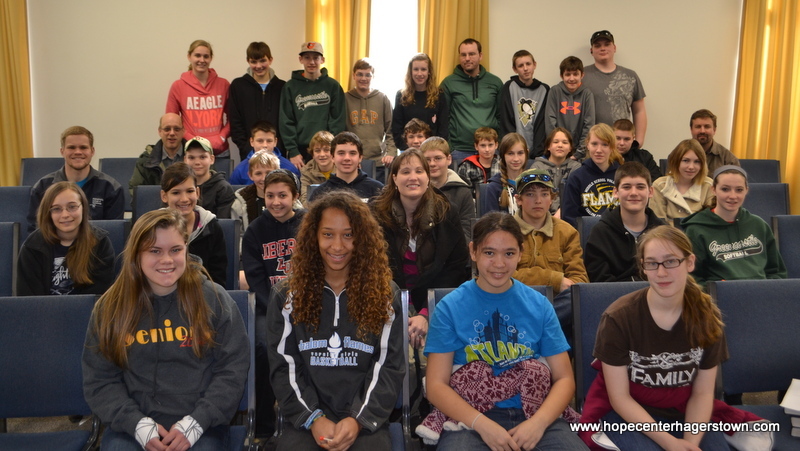 The group from Antrim BIC, lead by youth director, Brent Hey, consisted of 29 teens and 7 leaders. The volunteers from Antrim BIC were participating in World Vision’s 30 Hour Famine event which helps to raise funds for hungry children across the world by having young people fast for 30 hours as a collective group and take part in service projects, among other activities planned for the 30 hours. 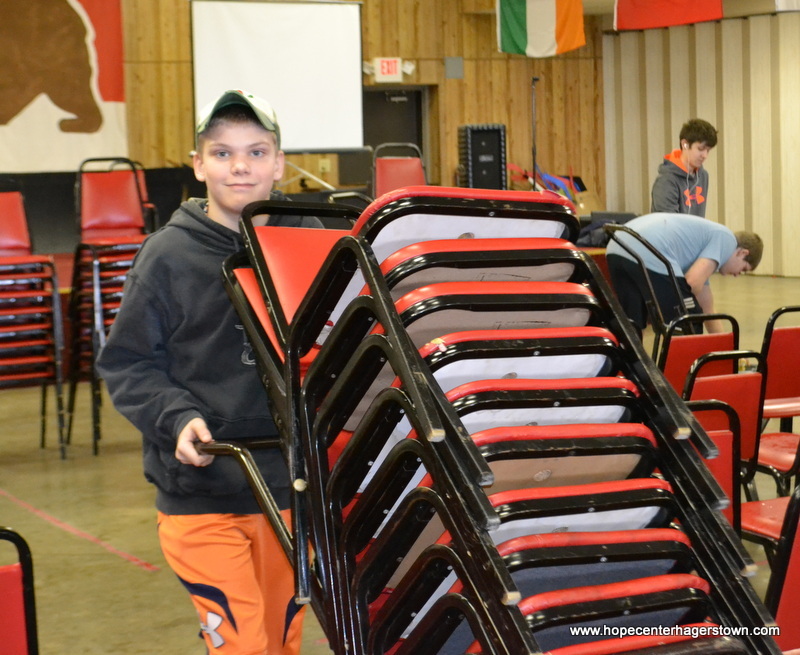 The youth group was not only learning the importance of helping people overseas, they were learning how to make a difference and reach out to people in their own backyard! While they were at The Hope Center, they helped in many different ways around our facilities: some washed baseboards and walls in our Transient waiting area, others cleaned our chapel, some cleaned carpets in the Wildside Youth department, a few helped in our Thrift Store, some cleaned chairs in the Trinity Center, washed windows throughout and organized donated personal care items and made personal care kits for transients. All these projects helped keep the kids busy but also helped us in a really big way! We are so thankful for the youth leaders and the teens who came from Antrim BIC to help serve. Volunteering is such a great way to teach young people so many valuable life and spiritual lessons. It doesn’t matter about the size of the group, anyone can help make a difference in the lives of so many. These teens may not really think that what they did was very important but God can use simple things like a warm meal, a clean facility or a bag full of soap & shampoo to touch a life and change it for eternity. The simple acts of kindness and love that were demonstrated by these two youth groups may not be fully recognized until we talk face to face with our Creator. It’s a mind-blowing thought to think that two hours of volunteer work can be the catalyst for a series of eternal events in the life of another human. Again, we’re so thankful for these young people, and the many other young people who’ve helped in the past. There are so many distractions for teens today so it’s a wonderful sight to see such vibrant lives helping others. If you’re in the process of looking for a church, why not check out one of these two churches? We value the strong relationship we have with Dublin Mills Community Church and Antrim BIC, as well as many other local churches who donate and volunteer regularly to help provide hope to Hagerstown and win lives for Christ. For more information about Dublin Mills Community Church, including service times and youth group information, please call 814.685.3910. Dublin Mills Community Church is located at 2700 Dublin Mills Road, Hustontown, PA.
Antrim Brethren in Christ Church is located at 24 Kauffman Road E, Chambersburg, PA, just across from Mrs. Gibbles Restaurant off of Route 11 north of Greencastle. For more info or to talk to someone from the church, call 717.375.4658. Check out all the various ministries & programs at Antrim BIC along with service times at www.antrimbic.org. This entry was posted in Community Involvement, Food Services, General, Thrift Stores, Transient Ministry, Volunteer and tagged 30 hour famine, Antrim, Antrim Brethren in Christ, Christian ministries, Dublin Mills Community Church, Greencastle, Hagerstown, Maryland, missions opportunities, missions trip, non-profits, Pennsylvania, rescue missions, soup line, Union Rescue Mission, volunteers, Washington County, youth group by hopecenterhagerstown. Bookmark the permalink.